Cilantro and cheese always had a close rivalry, each vying for the position of my Most Missed Ingredient when I was living in Japan. Now that I’m in California, the number one ingredient I miss from Japan is not really something I ever used in my cooking, but it’s a flavor that I love, and that I took for granted: yuzu (citron). Yuzu, or perhaps artificial yuzu flavoring, is everywhere in Japan: yuzu chuhai (shōchū cocktails), yuzu juice, yuzu candy, yuzu gum, yuzu ponzu sauce, yuzukoshō (chili paste), and yuzu sorbet. The best of all possible yuzu incarnations, though, is yuzu-cha (yuzu tea), which is probably even more commonplace in Korea — where it’s called yuja-cha — than it is in Japan. 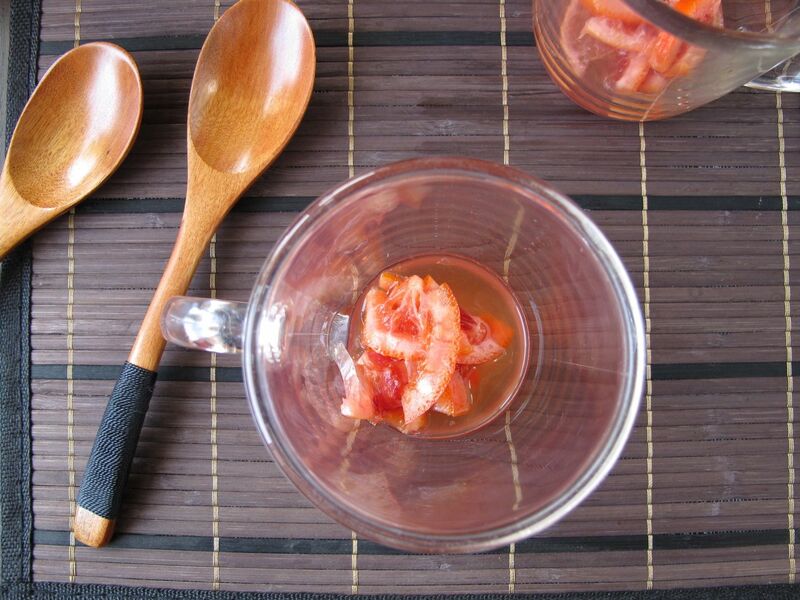 You can actually find yuzu tea sold in jars in most Asian markets, labeled 柚子茶 (yuzu-cha), 유자차 (yuja-cha), or “citron tea.” It might not fit your idea of a “tea” at first, though; it looks more like a jam, or a thick citrus marmalade of practically candied yuzu rinds, on the verge of dissolving completely into the honey they’re packed in. I love that type of storebought yuzu tea — dissolvable into either hot or cold water — and always keep a jar in the fridge. It’s hands-down my favorite caffeine-free tea, and the only thing I want to drink whenever I’m feeling slightly under the weather. 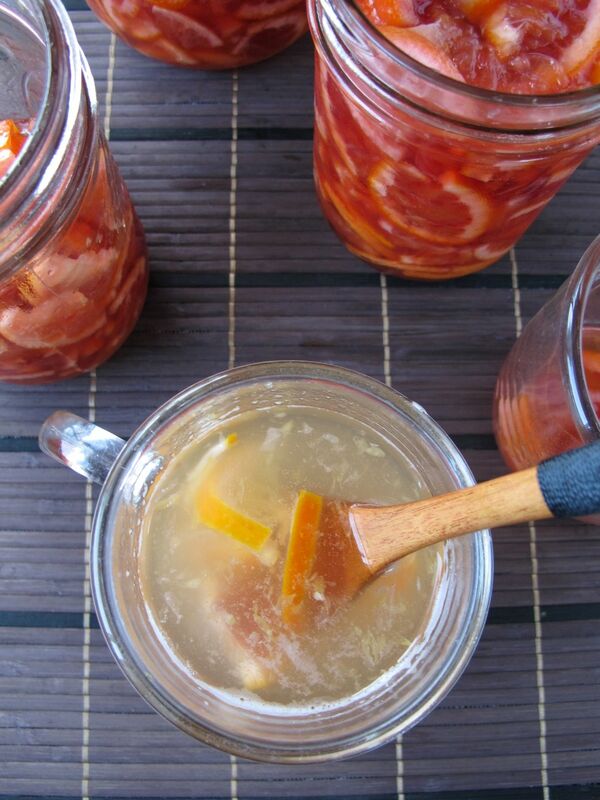 The agar is just like a vegan version of gelatin (made from seaweed/algae), which helps the tea firm up and look more like a marmalade, but we thought the sugar and fructose seemed unnecessary on top of the honey… so of course we set out to make our own! 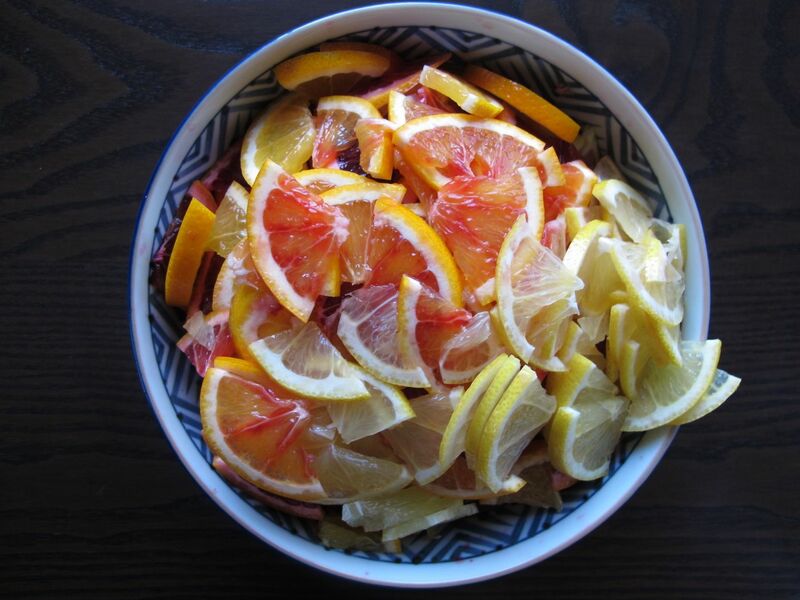 Luckily blood oranges and lemons seem to be an excellent — and more colorful — substitute. 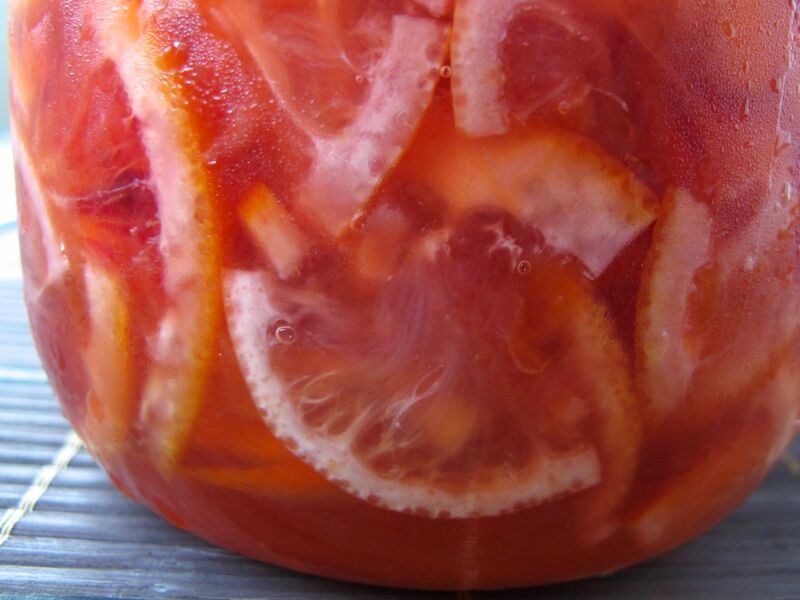 The combination of sugary oranges and tart lemons is similar to the acidity of yuzu, which falls somewhere in between, although it’s closer to lemons than oranges. 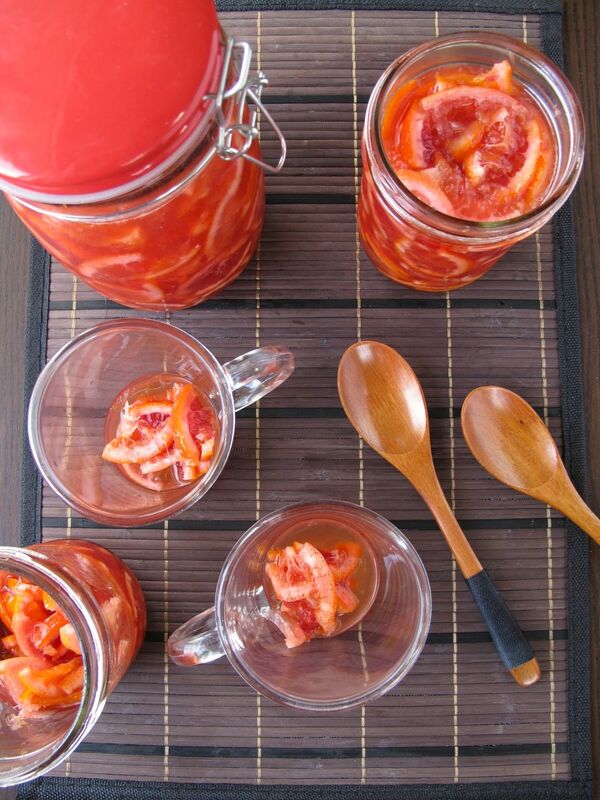 We used only fruit and honey, no other types of sweeteners, and let the sliced citrus ferment in a mixture of honey and its own juices for about 24 hours at room temperature, before moving the jars to the fridge. After only a week in the fridge, the citrus rinds have already started to break down a little into the tea (which is a lot less thick and jam-like than the storebought version since it’s missing agar — although as it sits in the fridge, it should gradually get thicker as the natural pectin in the rinds is released). 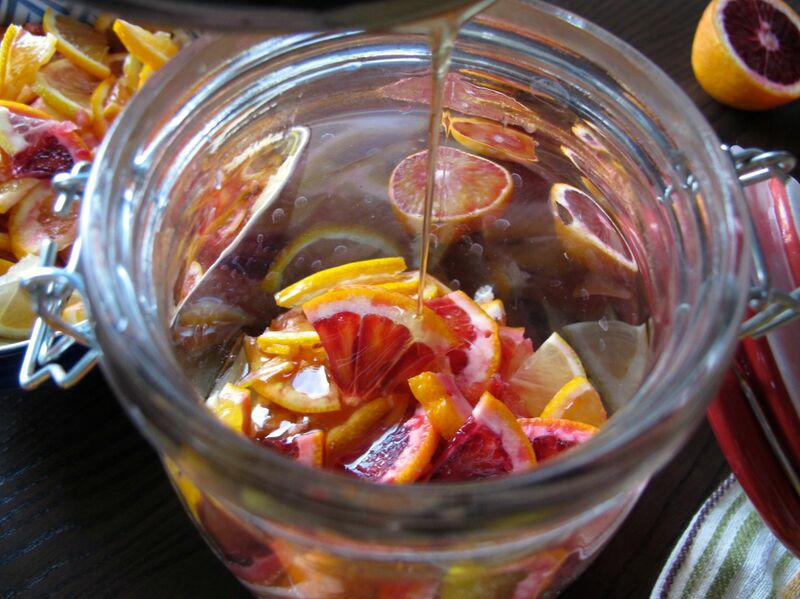 Since you’re going to be snacking on the rinds in between sips of tea, it’s important to buy only organic citrus (with peels that haven’t been waxed or sprayed), and to aim for fruit with peels as thin and smooth as possible. Yuzu peels are actually pretty thick, though, so of course plenty of white pith on the rinds is still acceptable: once it’s been preserved in the honey and fruit juice, even the acrid pith will taste a little juicy and sweet, though with a distinctly bitter edge to it. 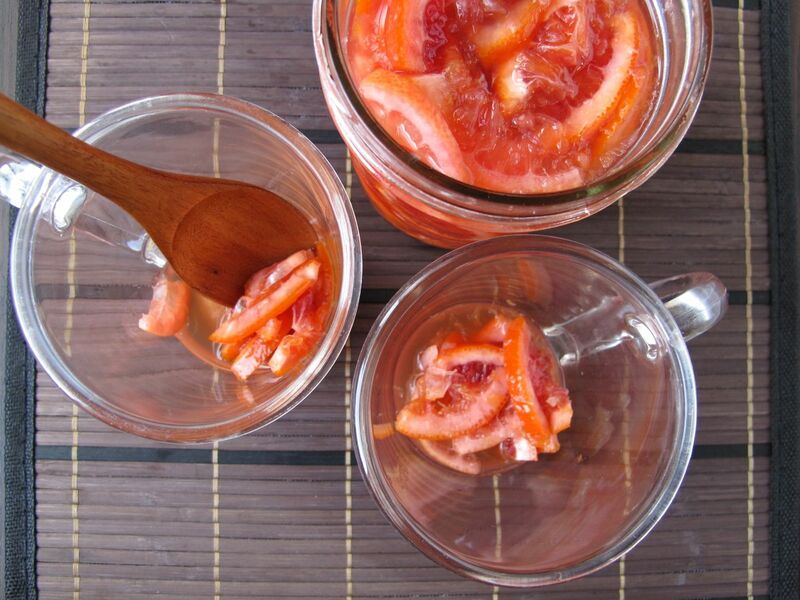 The blood orange tea comes close to yuzu tea, not just in sweetness, but also in complexity of flavor: the mixture of sweet honey, orange pulp, and juice, along with sour hints of lemon and the bitter preserved rinds, makes for a delicious cup of tea — and one that will only taste better if you have more patience than we did and let the citrus preserve in the fridge even longer. 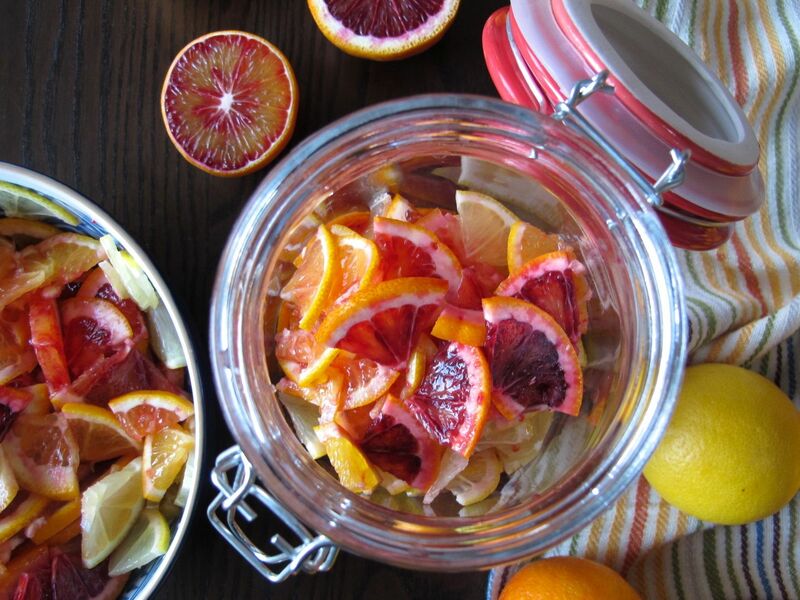 Note: In addition to using only organic, washed citrus, you also want to make sure to use raw (and local!) pure honey, just warmed up enough to make it easier to pour over the fruit. In the photos, I heated the honey up directly on the stove using a little saucepan, but later I discovered that it’s even easier to warm it just enough if you heat up a little water in a saucepan on the stove and keep the honey in a glass measuring cup that’s set into the warm water — almost like a double boiler situation — as you stir the honey until it seems soft enough to pour and dissolve into the fruit juice. Active time: 15 minutes; Total time: 24 hours at room temp. + 1 week in the fridge. 1. 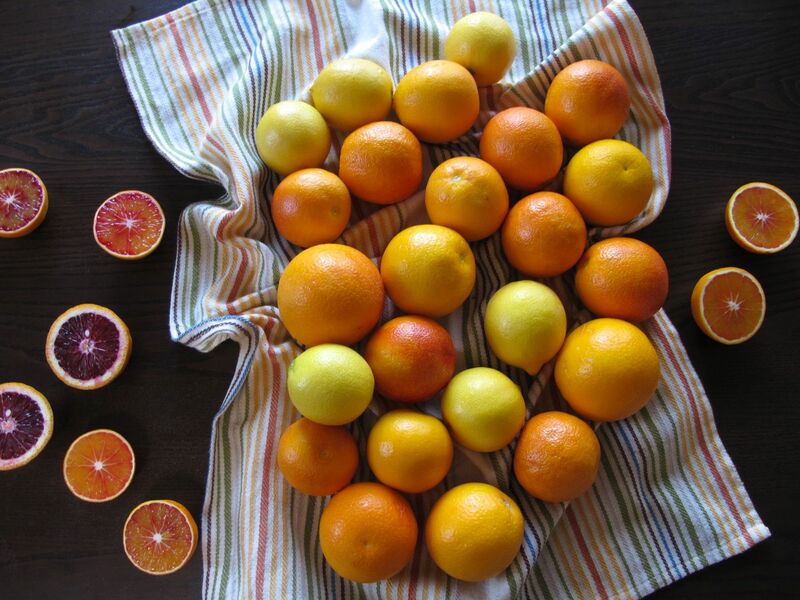 Slice the blood oranges and lemons as thinly as possible, and cut each round into fourths; remove and discard the seeds, but save all of the rind, pulp, and any juice that comes out while you’re slicing. 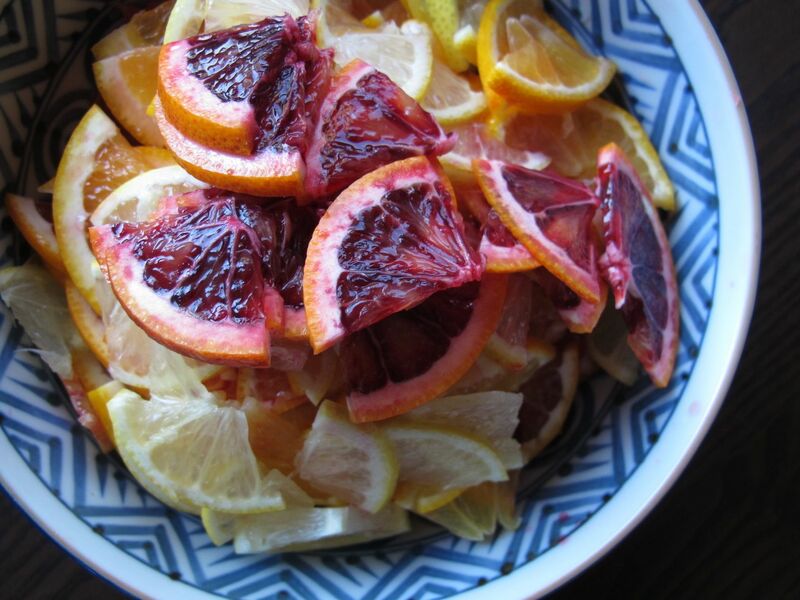 (You can discard the top and bottom slices of each piece of fruit, which are basically all peel, but first squeeze the juice out of them into your bowl/jar.) 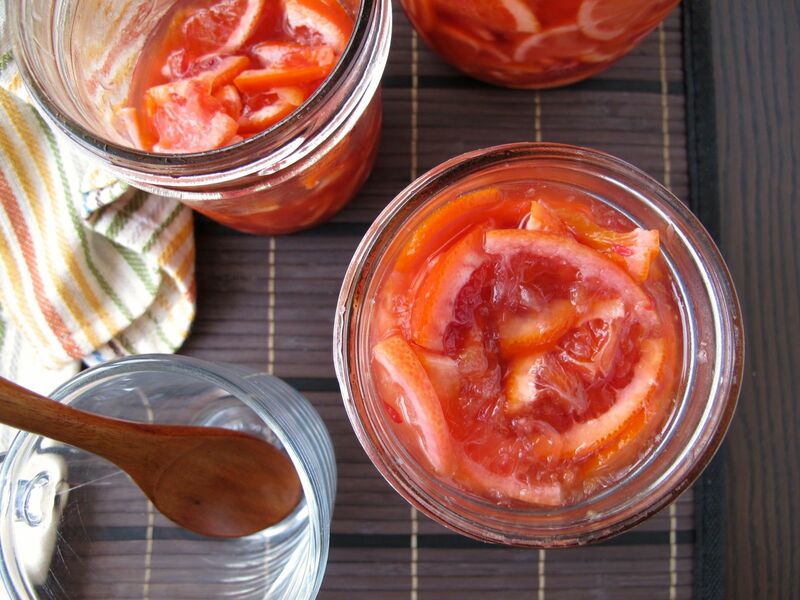 Transfer the sliced fruit and juice into a clean 1-quart jar or two clean pint jars, or any airtight container where the fruit comes nearly up to the top. 2. Gently warm up the honey by placing it in a glass bowl or liquid measuring cup that’s set into a saucepan of water over low heat. 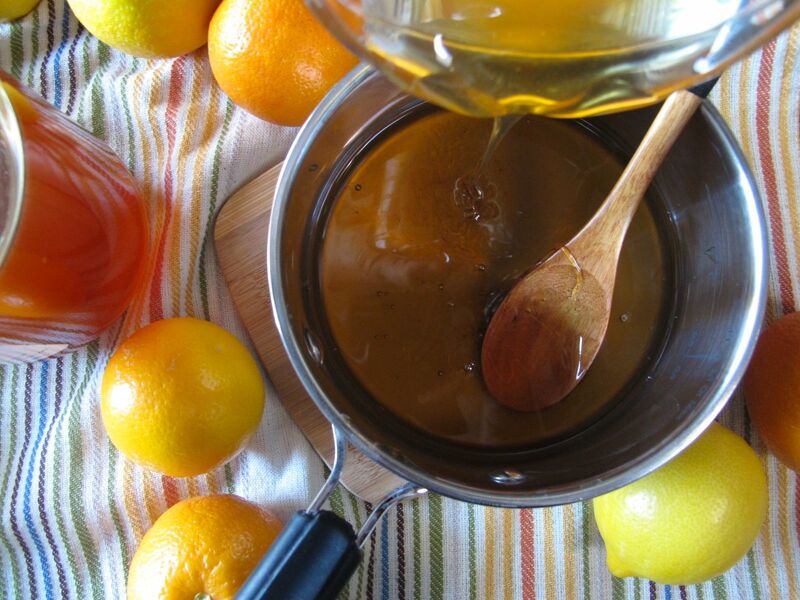 Stir the honey as it heats, until it seems thinner and more easily pourable (you can add a tablespoon or two of water — or the citrus juice — to the honey to thin it out if you want). 3. 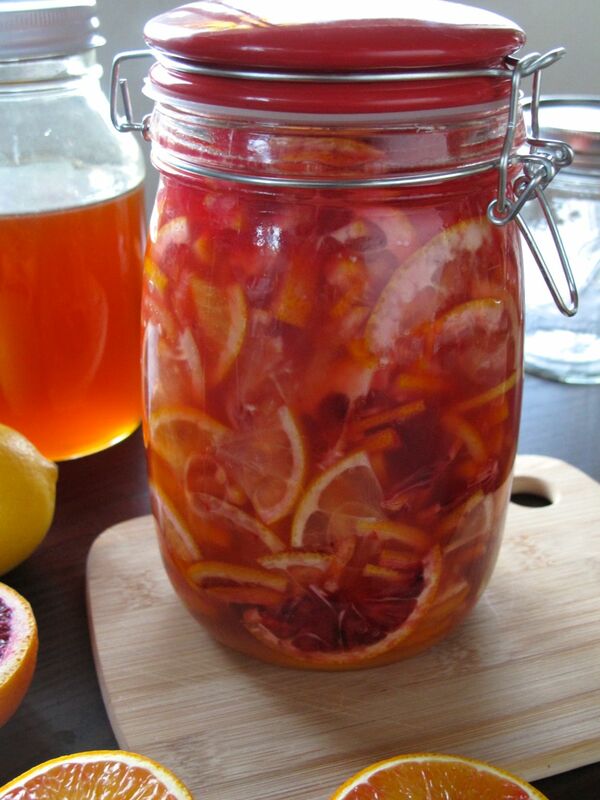 Pour the honey over the sliced fruit and mix well to coat the fruit in honey and to get rid of any pockets of air. 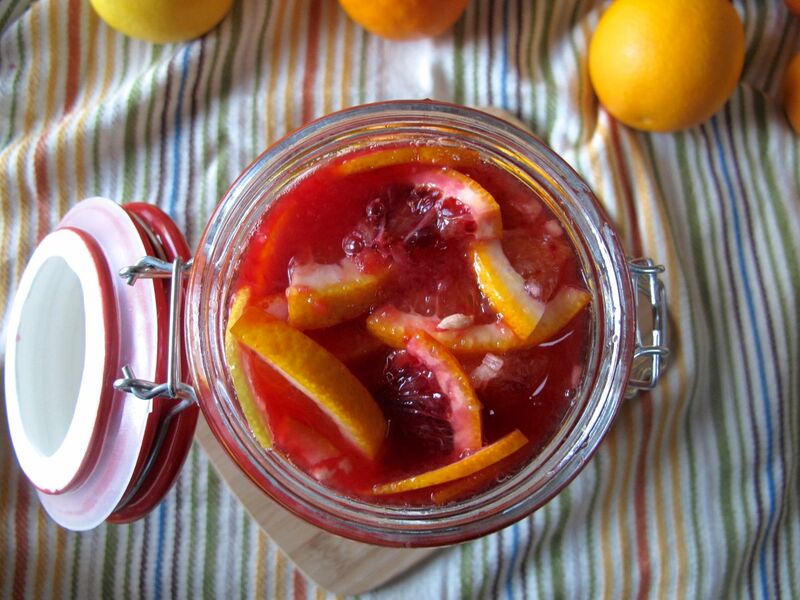 Make sure that the level of liquid (honey + fruit juice) in the jar is high enough to cover all of the sliced fruit — if it’s not, adjust by adding a little more juiced citrus, warm honey, or water. 4. 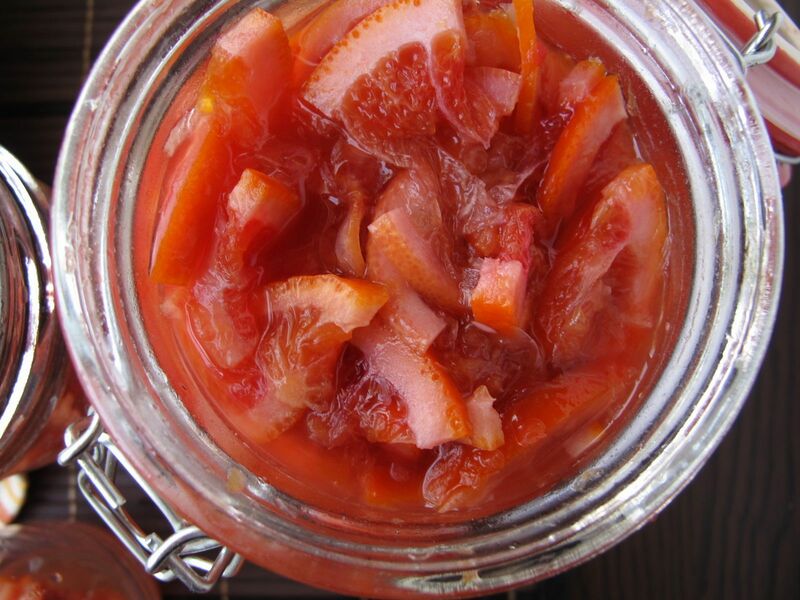 Close and let jar(s) sit out at room temperature for about 24 hours (less if it’s very warm out; or more — about 36 hours — if it’s relatively cool in your house). 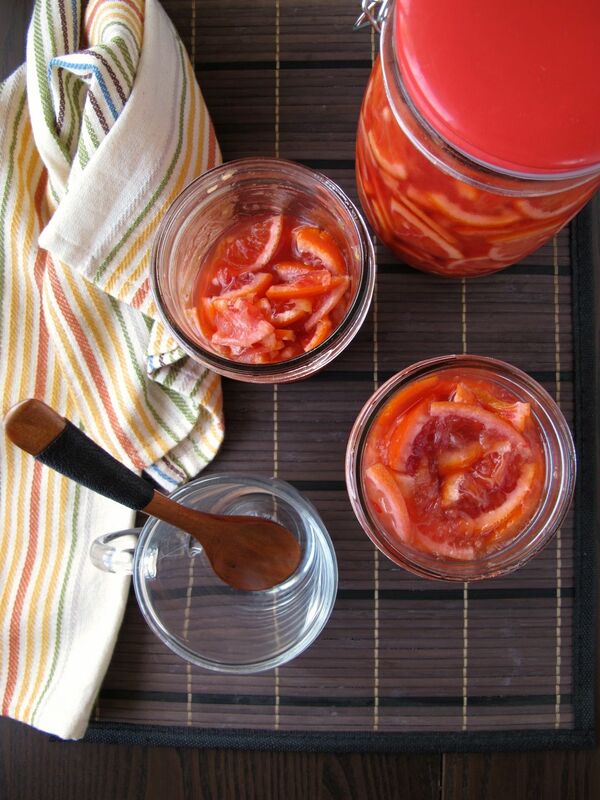 Then transfer jars to the fridge. Your tea should be ready to drink after about a week, and should last at least 1-2 months in the fridge. 5. 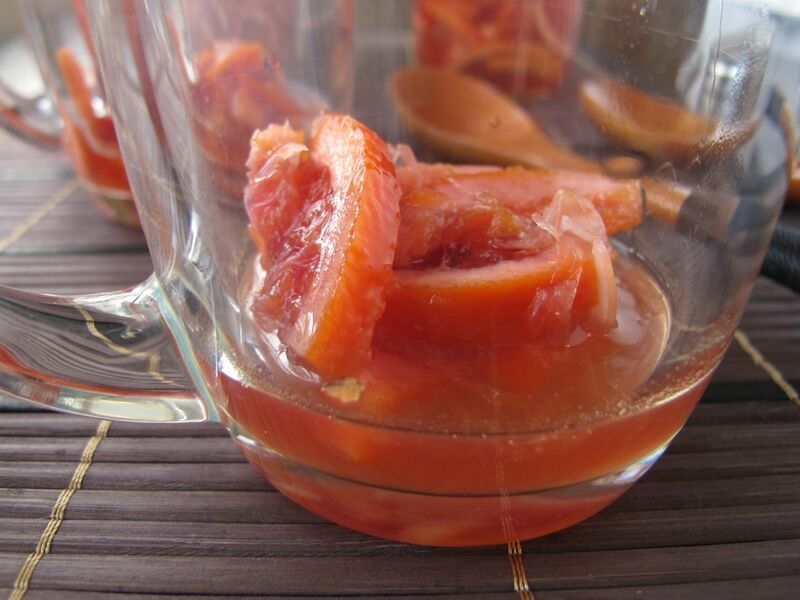 To make tea, place 1½ – 2 Tbsp. 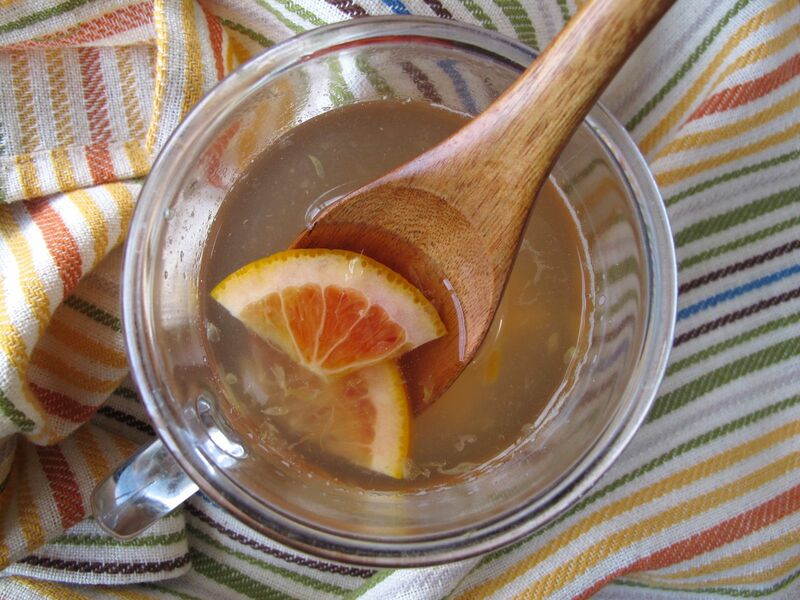 of the mixture (including citrus rinds + honey/juice liquid) into a mug, pour over hot water, stir, and enjoy. 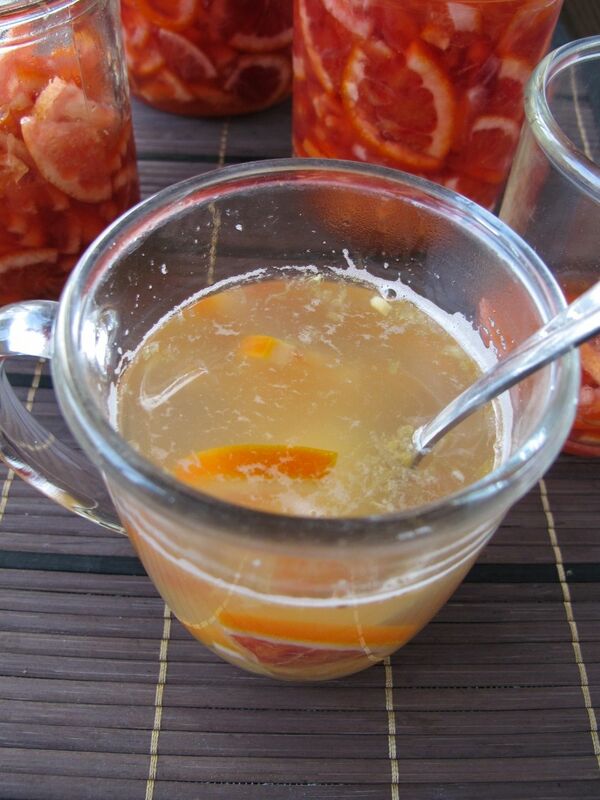 What a beautiful lemon tea, blood orange seems to be THE ingredient! Thanks, Uru! 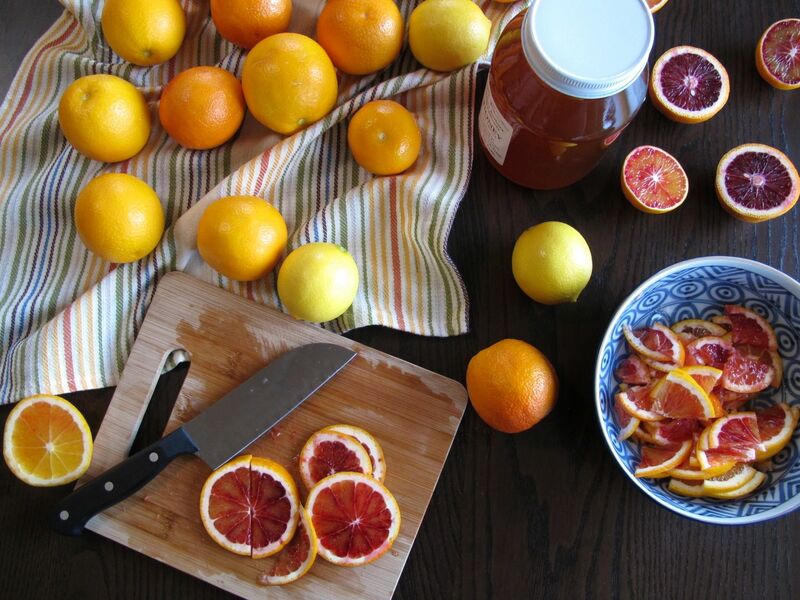 I know, Paula and I have really fallen for blood oranges the past few years. This year we’ve even been dehydrating slices of them to snack on; even with no added ingredients like that, they are so so good! Wow, that’s good to know — and they are really affordable! The only reasons I haven’t looked into something like that are: I live in an apartment with no yard, I don’t have a green thumb, and there are pretty strict quarantines on bringing citrus plants in and out of Santa Barbara county because of the risk they carry Asian citrus psyllid, so I’d have to find some yuzu that were grown in this county in the first place. so this sounds absolutely magical: i had no idea this existed! I mean, okay: i knew what yuzu was, but a jam-like tea? amazing. Listen: we have a pretty decent international market, and i’ll keep an eye out for yuzu. do you get finger limes there (Australian)? because if so, i feel like a fruit exchange program may be in order. Just in case someone is still looking – Four winds growers has one year old yuzu trees available now! (see link above)I just ordered one! I can’t wait! !